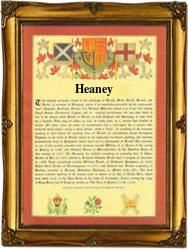 Recorded as O'Heaney, O'Henaghan, Hegney, Hanney, Heaney, Heeney and Hiney, this is an Anglo-Irish surname. If of Irish origins it derives from the pre 10th century name O' hEighnigh, believed to translate as "The descendant of the son of Bird" , although this translation is open to considerable discussion. The surname is found most often in the counties of Armagh and Louth, although it is said that in the 12th century one Teag O' hEighnigh was chief of Fermanagh. In its various spellings the name is also confused with the Scottish Hannay from the unidentified place, although to add to the confusion there is a place called Hanney in the English county of Berkshire, which has given rise to many different spellings. Early examples of the surname recording include Matthew O'Heney who died in the year 1202. He was originally a Cistercian monk who became archbishop of Ireland in 1196. Cornelius Heeney (1754- 1848) was born in Ireland, but made a fortune in America. On October 3rd 1675, Mary, daughter of William and Mary Hanney was christened at St. Giles Cripplegate, London. The first recorded spelling of the family name is shown to be that of Thomas Hanye, witness at a christening, which was dated June 16th 1537, St. Mary Bothaw, London, during the reign of King Henry V111, "Good King Hal", 1509 - 1547. Surnames became necessary when governments introduced personal taxation. In England this was known as Poll Tax. Throughout the centuries, surnames in every country have continued to "develop" often leading to astonishing variants of the original spelling.